Tabular 1 1/4x 2 1/2" hera crystal has a layered channel face with triplet tip and two extra faces - it's three crystals becoming one. 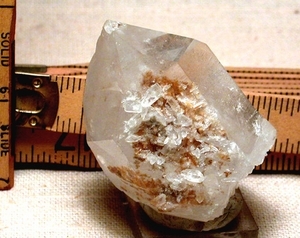 Uncommon even as an inclusion, the tan chlorite in this Arkansas crystal is a true phantom, and has great dimension easily seen. There is also the beginning of a very large record keeper on the main face, and smaller raised record keepers on other facets. Large inner foils give great brilliance and color. Two rare technicolor irises do, too. These 'oil slicks' historically were cut by jewelers and sold as opal. Several of its' many bright barnacle and penetrator crystals have rainbows as well. Self displays at several angles due to pronounced regrowth at its' base.